Hippie go lucky with a bite. Weird. Constantly entertained or moved. Exceptionally absentminded piercing artist in love with Ducatis, body modification, and Queen. I also love hockey, and I will say awful things about football (don't take me seriously). Caffeine and trance addict. Thinker of thoughts and writer of many silly things. Idealistic anarchist, gardener, fire spinner and reader of everything. Gun admirer, peace activist, chemistry geek, student of the Russian language. Sculptor, mask maker with a penchant for tie dying. Curiosity seeker, abrasive spectator, lover of b-horror flicks and time paradoxes. I pray to every god that has ever existed and try to love everyone (a wip). And uh...I believe in faeries. Ta-da? I love the people that make arts from my fics. Love.All.Of.You.SOOOOOOOOOMUCH. Thank you to the people that nominated my fics for the dokuga awards! Three chapters. A Beginning, a middle, and an end. To spit in the face of fate was nothing because she was everything he was, would ever be, and they were everything. He knows it is something he should not see, but he cannot look away because it is a miracle and a tragedy. Once upon a time there was virginal, chaste Kagome. And then there wasn't. Even after being put back together, fractures linger, spiderweb lines that remain, testament to the struggle. Kagome's new job offers exciting new opportunities in costuming. Too bad she hates them all. A randumb crack-ish fic for R0o. Not for minors. *Complete* All stars burn, and once he had burned more brilliantly than any other. Now he's stranded in a world that has forgotten him, afraid to face his former glory while desperately clinging to the shadow it casts. A corona is the halo of light surrounding a heavenly body. Sesshoumaru sees nothing but a sustained chemical reaction. Within it Kagome finds an escape. It's a new world, and Sesshoumaru has to get his sadistic jollies somehow. -For Riku Ryuu's oddjobs challenge. -Cannon Oneshot- Tattoos can be intensely personal. They can show clan loyalties, family ties, and sometimes they serve as reminders that the wearer is more than she appears to be. A/U When her boyfriend makes a demand, Kagome pretends to cave. However, she learns that sometimes plans backfire. The consequences will make her question everything she knew about herself. Not for minors. Dokuga exclusive. A tale of two brothers, a miko, and dreams. Written for Skye's Twisted Fairy Tales Challenge. After the battle with Naraku, Tenseiga decides the reluctant allies are not...quite done. Updated during DDNs. Sometimes growing up means growing apart, and sometimes growing apart means going away. But you can always come back. Some people prefer a bite to their sweet. He needs her, more than he has never needed anything. Sometimes we make our own prisons, and more often than not, love does not set you free. Sometimes a song is more than words, and words are more than simple thought. It begins with the taste of sweat and tears and salt stinging your tongue from the scent laying heavy in the air. We mark the exceptional moments in our lives like a timeline, each offering a new place to start. Running Up that Hill by Hatter Theory-Fanart! Ohh Hatter . . . if you don't return and update your stories - ANY of your stories!!! - I'm going to . . . ohh, I don't know . . .
SOMETHING RANDOM, INSANE AND TOTALLY CRAZY!!! I miss reading your wooorrrrkkkk! I just wanted to let you know that I think you're an amazing writer and I love all your stories! I recently became a fan due to Convivial and it urged to read all your works! :3 This includs your Kouga x Kagome which makes me want to write my own! I just noticed... you wrote three of my favorite stories. Undenied, Earning her Stripes, and I Found a Reason. I ever noticed before, hahahahah! I feel like an idiot. I'm so glad you've been enjoying them! 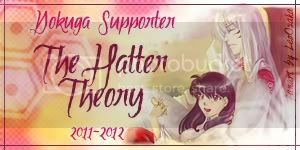 Feedback from The Hatter Theory: I do, IDOIDOIDO! Heyy! Thank you so much for your review on "The Shadow of Your Smile"! It made my day and I'm beaming like a rat now, if rats could beam.